Save 30% on Blurb print books until November 30th! ***Offer valid until November 30, 2013 (11:59 p.m. local time). Valid for print books only. A 30% discount is applied toward your product total with a minimum order of USD $60, CAD $60, GBP £60, EUR €60, or AUD $60. Maximum discount is USD $100, CAD $100, GBP £65, EUR €75, or AUD $100 off product total. This offer is good for one-time use, and cannot be combined with volume discounts, other promotional codes, gift cards, or used for adjustments on previous orders. People love getting really creative, one-of-a-kind books for Christmas. Books that elicit a “where did you find this?” response. 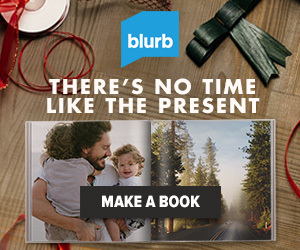 As the leading indie- and self-publishing platform, Blurb has an entire online bookstore full of unique books by an incredible array of undiscovered, self-published authors, artists, and photographers. And while these books probably aren’t in your recipient’s bookshelf, many of them should be. So, if you’re thinking of giving unique gifts this year, consider these titles. This book is a collection of 49 original poems by Kuba Ambrose selected from a decade of writing. This paperback volume is 122 pages in b\w on cream uncoated paper, 5×8 inches (13×20 cm) in size. The book contains 46 b/w images of artwork by the author. Click on the link to preview the book and order a copy. This is a catalogue of paintings, watercolours, drawings and etchings from over a decade of work. This full-colour soft-cover volume is 78 pages, 6×9 inches (9×23 cm) in size. Click on the link to preview the book and order a copy. LuminArte Gallery, conveniently located in the Dallas Design District, showcases contemporary award-winning artists, as well as bright emerging talent. Specializing in art placement and interior design consultation, the gallery presents collectors, designers and corporate clients with a diverse array of artwork in a variety of media, styles and techniques. Representing over forty artists from more than a dozen countries, LuminArte continues to embrace the local art community by hosting an artist in residence program, and by providing workshops and continuing education opportunities. Built from 1898 to 1901 as the house of watercolour painter Alfredo Roque Gameiro and his family, this house has an architectural style influenced by Nationalist ideals shared by both intellectuals and politicians of the 90’s generation of the 19th century. The initial project was conceived by Roque Gameiro himself, but architect Raul Lino changed it later. The inside of the main floor is covered by pattern tiles and decorated with small ornaments of colourful tiles at the end of doors and windows. In the dinig room, you will see tiles painted by Bordalo Pinheiro depicting bunches of grapes and ear corns. You can visit the living rooms of Roque Gameiro family, profusely decorated with tiles, as well as temporary exhibits in the two inferior floors of the building. zwei neue Drucke um 20% günstiger an.
" Blauer Adler " und " Mammutvogel "